Bella suffers from a rare progressive disorder that is called Morquio Syndrome. It affects her balance and reduces her mobility. She could only get around on crutches or in a wheelchair. After Bella and her mother volunteered at Service Dog Project, Inc for more than a year, Bella caught sight of George and it was love at first sight. Child and dog bonded right away. With George being a Great Dane, he is shoulder height to the child and he supports her when walking, which increases her mobility. 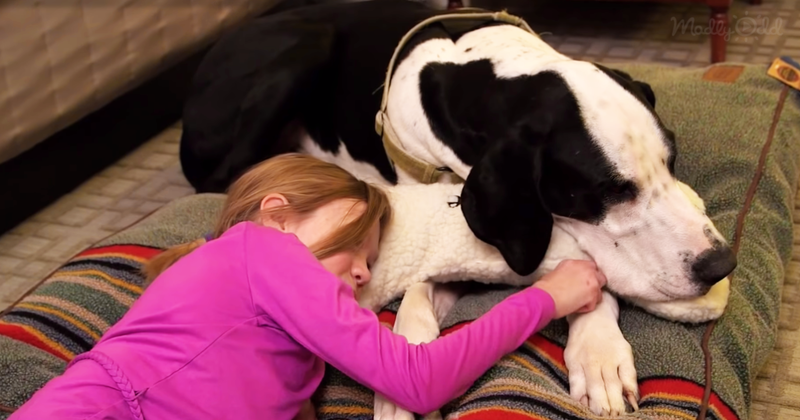 The 11-year-old-girl relies on George every day and he never lets her down. They share a very special relationship. When BarkPost heard about George’s contribution to Bella’s quality of life, they awarded the devoted service dog their “Dogs Best Day” honor. On George’s “Best Day Ever”, Bella joins her buddy and the two of them have a fabulous time. First, he gets served with a huge tray full of burgers – George loves burgers! Next, they move on to the “Epic Snow Day” activity for a romp outside in the snow, which is George’s absolute most favorite activity. He acts like a delirious puppy, racing around in the soft, powdery snow while Bella is enjoying her best friend’s fun on a toboggan. After the snow fun, they go to a doggy treat store and George gets to sample a whole swag of yummy treats. To top it all off, he is given a giant bone! But the celebrating isn’t over yet. Bella and George get to stay in a luxury hotel room full of doggy toys of all shapes and sizes. George unleashes his inner puppy again and has a wonderful time. Then there are the gifts for this deserving service dog, he gets a giant doggy bed, actually big enough for him, and he is given his own sweater. Bella is so thrilled to be a part of her best friend’s wonderful experience. Everyone who was moved by Bella’s gift to her big best friend, be sure to share her video with your friends.